The Kindergarten Team won a grant to purchase a STEM program called Future Designers and Engineers. The program consists of task cards and bins containing materials for self directed projects. It provides hands-on experiences that will increase student’s vocabulary, problem solving skills, and critical thinking. There is also a writing piece included in the kits that would help students express and explain their ideas to others. 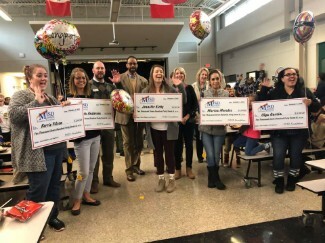 Congratulations Jennifer Kirby, Olga Garcia, Rebecca Anderson, Kerrie Filson and Marisa Romero! Thank you for your dedication to our students.